Oracle Resource manager is about prioritising one database session over another, or about restricting the overhead of one session for the good of the other database users. A resource plan is a set of rules that are applied to some or all database sessions for some or all of the time. Those rules may be simple or complex, but they need to reflect the business's view of what is most important. Either way Oracle resource manager requires careful design. I am not going to attempt to further explain here how the Oracle feature works, I want to concentrate on how PeopleSoft interfaces with it. This feature effectively maps Oracle resource plans to PeopleSoft executables. The resource plan will then manage the database resource consumption of that PeopleSoft process. There is a new component that maps PeopleSoft resource names to Oracle consumer groups. For this example I have chosen some of the delivered plans in the MIXED_WORKLOAD_GROUP that is delivered with Oracle 11g. The Oracle Consumer Group field is validated against the name of the Oracle consumer groups defined in the database, using view . PS_PTEXEC2RESOURCE is another new table that maps PeopleSoft executable name to resource name. Unfortunately, the consequence of this explicit switch is that it overrides any consumer group mapping rules, as I demonstrate below. The PeopleSoft owner ID needs some additional privileges if it is to be able to switch to the consumer groups. The RESOURCE_MANAGER_PLAN initialisation parameters should be set to the name of the plan which contains the directives. I question one or two of the mappings on PS_PTEXEC2RESOURCE. PSNVS is the nVision Windows executable. It is in PeopleTools resource MISCELLANEOUS. This is nVision running in 2-tier mode. I think I would put nVision into the same consumer group as query. I can't see why it wouldn't be possible to create new PeopleSoft consumer groups and map them to certain executables. nVision would be a candidate for a separate group. PSQED is also in MISCELLANEOUS. Some customers use it to run PS/Query in 2-tier mode, and allow some developers to use it to run queries. Perhaps it should also be in the QUERY SERVER group. I would like to be able to blend the PeopleSoft configuration with the ability to automatically associate Oracle consumer groups with specific values of MODULE and ACTION. Purely as an example, I am trying to move the Process Monitor component into the SYS_GROUP consumer group. So I have created a new SQL*Plus session and set the module/action and it has automatically mover into the SYS_GROUP. Meanwhile, I have been into the Process Monitor in the PIA and the module and action of the PSAPPSRV session has been set, but they remain in the interactive group. If I set the module to something that doesn't match a rule, the consumer group goes back to OTHER_GROUPS which is the default. Now, if I explicitly set the consumer group exactly as PeopleSoft does my session automatically moves into the INTERACTIVE_GROUP. Next, I will set the module back to match the rule, but the consumer group doesn't change because the explicit setting takes priority over the rules. You can rearrange the priority of the other rule settings, but explicit must have the highest priority (if you try will get ORA-56704). So, continuing with this example, I cannot assign a specific component to a different resource group unless I don't use the PeopleSoft configuration for PSAPPSRV. Instead, I could create a rule to assign a resource group to PSAPPSRV via the program name, and have a higher priority rule to override that when the module and/or action is set to a specific value. However, first I have to disengage the explicit consumer group change for PSAPPSRV by removing the row from PTEXEC2RESOURCE. So, you would have to choose between using either the PeopleSoft configuration or the Oracle Resource Manager configuration. It depends on your requirements. This is going to be a decision you will have to take when you design your resource management. Of course, you can always use just the mapping approach in versions of PeopleTools prior to 8.54. I have never seen Oracle Resource Manager used with PeopleSoft. Probably because setting it up is not trivial, and then it is difficult to test the resource plan. I think this enhancement is a great start, that makes it very much easier to implement Oracle Resource Manager on PeopleSoft. However, I think we need more granularity. I would like to be able to put specific process run on the process scheduler by name into specific consumer groups. For now, you could do this with a trigger on PSPRCSRQST that fires on process start-up that makes an explicit consumer group change (and puts it back again for Application Engine on completion). I might want to distinguish between PSQRYSRV processes used for ad-hoc PS/Queries on certain domains from PSQRYSRVs used to support nVision running in 3-tier mode on other domains. I might have different PIAs for backup-office and self-service users going to different applications servers. I might want to prioritise back-office users over self-service users. PeopleTools simply evaluates this meta-SQL as 'DUAL' on Oracle. In Oracle, DUAL is just a convenience table. You don't need to use it, you can use anything you want. PeopleSoft applications often use PS_INSTALLATION when they needs a single row source in a query. This was another example of platform agnosticism. PS_INSTALLATION is available on every platform and every PeopleSoft installation, DUAL is not. There are two advantages to using DUAL. In the database, the Oracle optimizer knows that DUAL is a special one row, one column table. When you use it in queries, it uses this knowledge when generating the execution plan. If you used a real table, there was a risk that it could have no rows, or more than one row. Either could cause application problems. In previous versions of Oracle, when it was a real physical table, that problem could also occur with DUAL. However, since Oracle 10g it is just a memory structure in the database, and accessing it involves neither a logical nor a physical read. PeopleSoft have created a Meta-SQL that evaluates as DUAL so that this Oracle optimization is implemented in a PeopleSoft platform generic manner. I would not bother to go back and change existing code to use this, unless perhaps I was visiting the code anyway, but I would certainly recommend its use going forward. It is particularly effective with the %InsertSelect meta-SQL. Previously the only way to put a hint into the main select was with a variable assignment, but that didn't work if the DISTINCT keyword was used because the hint appeared behind the distinct. Here is a deliberately contrived example of how to use the command. I have created a separate SQL object, DMK_CURJOB, to hold effective date/sequence sub-queries which I will reference from an application engine SQL. I want my insert statement to run in direct-path mode, so I am putting an APPEND hint into the INSERT statement. I am going to put different hints into each of the different SQL query blocks, including the sub-queries in the SQL object. The %SQLHint processing appears to be done after all other expansions, so the search and insert can reach into %SQL objects. Previously we had to put hints into the SQL object. Although, sometimes, we could avoid that by using query block naming hints. Now, I can place any hint after any SQL command. I can choose to apply a hint in just one step that references a SQL object, rather than in the SQL object which affects every step that references it. If you put multiple substitutions in for the same SQL command, only the last enabled one is processed. I frequently find that developers love to put comments into SQL which then appears in logs files and Oracle monitoring tool. I hate that. Comments in SQL that run on the database is an unnecessary overhead, and it turns up later in SQL monitoring and tuning tools. It is worth noting that comments that are not hints are stripped out of SQL in PL/SQL procedures. Perhaps developers should put their comment in a disabled %SQLHint so it will not appear in the final SQL? All this talk of adding hints to source code is going to cause an Oracle DBA to ask why not use the techniques provided by Oracle to control execution plans on application engine SQL. The problem is that those techniques are frequently thwarted by the dynamic nature of SQL created by PeopleSoft. Bind variables can become literals when the SQL is generated, though profiles and baselines can handle this. Different instances of temporary records are different tables in the database. You would have to handle each table (or every combination of tables if you have multiple temporary records in one statement). Many delivered processes have dynamically generated SQL and you would again have to handle every variation separately. The %SQLHint meta-SQL brings a huge advantage for Oracle's PeopleSoft developers. Although it is possible to create platform specific application engine sections, there is huge reluctance to do this in development in Oracle. This is entirely reasonable as it results in having to develop, test and maintain separate code lines. Many of the meta-SQL macros are designed precisely to overcome SQL differences between different supported database platforms. Now, using %SQLHint they can now put Oracle specific optimizer hints into platform generic application engine steps, safe in the knowledge that the hints will only affect Oracle platforms. This is going to be a very useful feature. Simple. Effective. I look forward to hinting the places that other techniques cannot reach! Partitioning of table (and index) segments involves breaking them into several smaller segments where certain data values only occur in certain segments. Thus if a query is looking for a certain data value it may be able to eliminate some partitions without having to scan them because by definition those values cannot occur in those partitions. Thus saving logical and physical read, and improving performance. This is called partition elimination or pruning. It is often the principal reason for partitioning a table. Physically each partition in a partitioned table is a table, but logically the partitions form a single table. There should be no need to change application code in order to use partitioning, but the way the code is written will affect Oracle's ability to perform partition elimination. If a query was only looking data in March, then it could eliminate the January and February partitions without inspecting them. However, if it was filtering data by another column then it would still have to inspect all three partitions. Application design will determine whether, and if so how to partition a table. NB: I can't mention partitioning without also saying that Partitioning Option is a licensed feature of Oracle Database Enterprise Edition. I have to declare an interest. I have been using partitioning in PeopleSoft since PeopleTools 7.5 when it was introduced in Oracle 8i. The line from PeopleSoft was that you can introduce partitioning without invalidating your support (the same is not true of E-Business suite). Application Designer won't generate partition DDL, so you were supposed to give your DDL scripts to the DBA who would add the partition clauses. So you if wanted to use partitioning, you would be plunged into a hellish world of manual scripting. One of the key benefits of Application Designer is that it generates the DDL for you. Is my partitioning utility was now obsolete? Or should I continue to use it? How would I be able to retrofit existing partitioning into PeopleTools? I am going to illustrate the behaviour of the new partition support with a number of example. the other partition will contain the other statuses; 2 and 3 which are the closed items. The application repeatedly queries this table looking for work lists items to be processed, using the criterion INSTSTATUS < 2. Over time, unless data is archived, the vast majority of entries are closed. This partitioning strategy will enable the application to find the open worklist items quickly by eliminating the larger closed partition only querying the smaller open item partition. As items are worked or cancelled, their statuses are updated to 2 or 3, and they will automatically be moved to the other partition. This is something that I have actually done on a customer site, and it produced a considerable performance improvement. PeopleSoft provides a component that allows you to configure the partitioning strategy for a record. However, I immediately ran into my first problem. The Partitioning Utility component will only permit me to partition by a PeopleSoft unique key column. If a query doesn't have a predicate on the partitioning column, then Oracle will certainly not be able to prune any partitions, and the query will perform no better than if the table had not been partitioned. While a column frequently used in selective criteria is often the subject of an index, and sometimes the unique key, this is not always the case. It does not make sense to assume this in this utility component. In this case, INSTSTATUS is not part of any delivered index, though I added it to index B. I have seen that the application frequently queries the PSWORKLIST table by INSTSTATUS, so it does make sense to partition it on that column. However, I can customise the component to get around this. The key field is validated by the view PPMU_RECKEYS_VW. I notice that can leave tablespace blank in component, but the tablespace keyword is lying around - so I have to put a tablespace in. It is valid to omit physical attributes at partition level and they will be inherited from table level, and similarly for table level. The component automatically adds a MAXVALUE partition. This means that is valid to put any value into the partition column, otherwise it can cause an error. However, it might not be what I want. The component also adds a table storage clause, overriding anything specified in the record, with a fixed PCTFREE 20 which applies to all partitions. Again this might not be what I want. The value of PCTFREE depends on whether and how I update data in the table. The tablespace of the MAXVALUE partition, which defaults to be the same tablespace as the last defined partition, which might not be what I want. Any other physical attribute of any of the partitions, for example I might want a different PCTFREE on partitions containing data will not be updated. The component adds clause to enable row movement. This permits Oracle to move rows between partitions if necessary when the value of the partitioning key column is updated. In this case it is essential because as worklist items are completed they move from the first partition to the other. ALTER TABLE ... SHRINK requires row moment, so it is useful to enable it generally. The partitioning definition can be viewed in Application Designer under Tools -> Data Administration -> Partitioning. The create table script (PSBUILD.SQL) does not contain any partition DDL. So first you build the table and then alter it partitioned. To be fair, this limitation is set out in the PeopleTools documentation, and it is not unreasonable as you would often build the table and then decide to partition it. I do the same in my own utility. The DDL to create partitioned index does not seem to appear properly. The first CREATE INDEX command was generated by Application Designer extracting it from the catalogue with DBMS_METADATA. This functionality was introduced in PeopleTools 8.51 to preserve existing configuration.The second create index comes from the partitioning definition. The index column list is missing, it should come from the column list is defined in Application Designer. The locally partitioned index is the same tablespace as the table instead of the tablespace defined on the index. I would not normally keep indexes in the same tablespace as the table (the rationale is that in the case of having to recover only a tablespace with indexes then I could rebuild it instead of recovering it). I also note that the table is not altered NOLOGGING. Yet the indexes are still made NOPARALLEL. The default degree of parallelism on a partitioned table is equal to the number of partitioned, so it will cause parallel query to be invoked on the table access. I strongly recommend against generally allowing parallel query in all SQLs that reference a partitioned table in an OLTP system, which is what PeopleSoft is. There are occasions where parallel query is the right thing to do, and in those cases I would use a hint, or SQL profile or SQL patch. If I leave the Partitioning Utility component and then go back to a record where I have previously created partition DDL, then the partition DDL is still there, but all the other information that I typed in has disappeared. If you trace the SQL generated by this component while entering partition details and generating partition DDL, then the only two tables that are updated at all; PS_PTTBLPARTDDL and PS_PTIDXPARTDDL. They are both keyed on RECNAME and PLATFORMID and have just one other column, a CLOB to hold the DDL. The partition information disappears because there is nowhere to hold it persistently, and the component cannot extract it from the DDL. It was being entered into a derived work record. So it is not going to be much help when I want to adjust partitioning in a table that is already partitioned. For example, over time, I might want to add new partitions, compress static partitions, or purge old ones. It is also clear that there is no intention to support different partitioning strategies for different indexes on the same table. There are certainly cases where a table will one or more locally partitioned indexes and some global indexes that may or may not be partitioned. Even these two tables are not fully integrated into Application Designer. There is a throwaway line in Appendix E of the Data Management Guide - Administering Databases on Oracle:"Record and index partitioning is not migrated as part of the IDE project. If you want to migrate the partitioning metadata along with the record, you will need to…" copy it yourself and it goes on to recommend creating a Data Migration Project in the Data Migration Workbench"
Sticking with PSWORKLIST, I have partitioned it exactly the way I want. The partition DDL was generated by my own partitioning utility . I have added INSTSTATUS to index B. The DDL in the Maintain Partitioning box in Application Designer is extracted from the data dictionary using the Oracle supplied DBMS_METADATA package. Application Designer has done this since PeopleTools 8.51 for index build scripts, but now you can see the DDL directly in the tool. When I generate an alter table script I still get two create index command for the partitioned index. The second one comes from the generated partition DDL and is not correct because it still doesn't have a column list. the largest result tables are sub-partitioned on CAL_RUN_ID so each payroll period is in a separate physical partition. Later I can archive historical payroll data by partition. Here, I have swapped the partitioning over. I have partitioned by CAL_RUN_ID and sub-partitioned by EMPLID. I explain why below. And this is Table DDL that the utility generated. Use of the sub-partition template clause simplifies the SQL. There is certainly a lot less of it. However, it means you get all the sub-partitions within in all partitions. That might not be what you want. In this demo database both employees and calendars are prefixed by something that corresponds to legislature, so some partitions will be empty. They won't take up any physical space, due to deferred segment creation, but it would be better not to build them at all. I can specify tablespace on the sub-partitions in the utility component, but there is no tablespace on the sub-partition template in the DDL. I care more about putting different payroll periods into different tablespaces, than different ranges of employees (so I can compress and purge data later) so I swapped the partition key columns and have range partitioned on CAL_RUN_ID and sub-partitioned on EMPLID. In Global Payroll, partitioning is required to support streamed processing. Tables are range partitioned on EMPLID to match the stream definitions. In UK payroll, there are 45 tables that are updated or heavily referenced by streamed payroll processes that should all have similar range partitioning on EMPLID. In PeopleTools 8.54, it is not possible to define a single partitioning strategy and consistently apply it to several tables. Even if the data entered into the partition utility component was retained, I would have to enter it again for each table. When I heard that PeopleTools would have native support for partitioning, if only in Oracle, I was hopeful that we would get something that would bring the process of migrating and building partitioned tables in line with normal tables. Unfortunately, I have to say that I don't think the partitioning support that I have seen so far is particularly useful. There is no point typing in a lot of partition data into a utility component that doesn't retain the data. As with materialized views, table partitioning is something on which DBAs will have to advise and will probably implement and maintain. This component doesn't really help them do anything they already do with a text editor! Even the minimal partition data that the utility component does retain is not migrated between environments by Application Designer when you migrate the record. Again, I think the problems stem from PeopleTools development trying to minimize the level of alteration to the Application Designer. The partitioning utility component looks good because it sets out a lot of the partition attributes and metadata that you do need to consider, but there is no data structure behind that to hold it. I would like to see PeopleTools tables to hold partitioning metadata for tables and indexes, and for Application Designer to build DDL scripts to create and alter partitioned tables, to add partitions to existing tables, and then to migrate those definitions between environments. One positive that I can take from this is that Oracle has now clearly stated that it is reasonable to introduce partitioning into your PeopleSoft application without invalidating your support. The position hasn't actually changed, but now there is clarity. Snapshots were introduced in Oracle 7. They were a way of building and maintaining a physical table to hold the results of a SQL query. We are well used to a view being the results of a query, but here the results are materialised into a physical table. Hence the feature was renamed materialized views in Oracle 8i. Today materialized views are one among many replication technologies. They are available in standard edition Oracle, and there is no licensing implication in their use. A simple, single-table materialized view. Often used to replicate data across a database link from another database. Or to produce a subset of the data. A materialized view log is created on the source table to record all the changes made to the source table. It holds the primary key of the changed row, or the rowid (physical address of the row). It can optionally hold additional columns. It is populated by a database trigger on the source table (since Oracle 8i that trigger is hidden). Usually done within a single database rather than across a database link. Can only be refreshed by being completely rebuilt. If the same query as is used in a materialized view is submitted, Oracle can rewrite the query to use the materialized view instead. Query rewrite only occurs subject to configuration and certain pre-requisites being met. Materialized Views can be populated immediately when they are built, or later on demand. They can be refreshed on demand, on a regular schedule by a database job, or immediately when an update to a source table is committed. Materialized views can be put into Refresh Groups. All the materialized views in a refresh group are refreshed in the same database transaction so the data in the materialized views is consistent. Materialized views can be updatable and used for bidirectional replication. I am not going to talk that here. When you introduce materialized views into an application you need to consider what you are trying to achieve, and make design decisions accordingly. 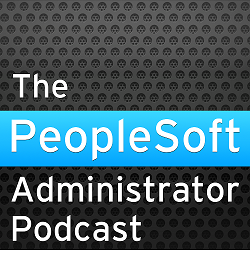 Using this new feature in PeopleSoft is deceptively easy, but quite a lot is going on behind the scenes. PeopleSoft Documentation (the term PeopleBooks seems to have been replaced by PeopleSoft Online Help): Data Management, Using Materialized Views provides an overview. PSPTMATVWDEFN - addition definition fields for the materialized view, build, refresh, staleness, stats. Doesn't contain the query, that is in PSSQLTEXTDEFN as it is for all other views. PSPTMATVWDEP - lists tables upon which materialized view depends. PeopleSoft seems to work this out for itself by parsing the SQL query. I am going to demonstrate some aspects of the feature by running through some examples. In this example I am going to use a materialized view to replicate a table from another Oracle database across a database link. If I select SQL View the Materialized View check box appears, if I check the checkbox the Materialized View Options appear. However, if the materialized view already exists, the script will drop it, recreate and drop the view, and then recreate the materialized view. The Application Designer build script creates the materialized view using a primary key based replication. If there is no WITH PRIMARY KEY clause specified, because it is the default. There appears to be no way to get Application Designer to generate a WITH ROWID clause, so it is not possible to replicate a single table without a unique key. You might question whether that is useful, but it is possible in Oracle. If you specify any key columns on the materialized view it does not result in the usual indexes that you get on tables. Also, it is not possible to add additional user specified indexes to the materialized view - the option is greyed out. This is rather disappointing, because you might want to do exactly that so you can query the materialized view it in different ways to the underlying table. You will get a unique index on a materialized view that is replicated by primary key, because the primary key will be inherited from the underlying table. Nor is it possible to specify partitioning in Application Designer on a materialized view. You can specify storage options on the materialized view via Record DDL, but the storage options do not appear in the CREATE MATERIALIZED VIEW statement in the build script. This is rather disappointing because you don't need to provide free space for updates in a materialized view which is completely refreshed each time, but you might if you do incremental update. In this example, I am again only replicating 6 named columns into my materialized view. I don't know why it rebuilds the non-materialized view as a normal view and drops the primary key constraint each time every time but it does. You might not want to do this every time for a large materialized view that takes time to build. If the materialized view log has been built, next time you generate the view build script it creates and drop the view and then builds the materialized view. It is rather odd to see a build script update a PeopleTools table. Application Designer also updates the PSPTMATVWDEFN table itself every time it generates the build script. Note that the script doesn't issue an explicit commit, so if you execute the build script in SQL*Plus remember to commit to release the row level lock on PSPTMATVWDEFN. Application Designer flip-flops between these two build scripts that will repeatedly drop and create the materialized view and materialized view log. Unless you are very careful you might not know whether you have the objects in the desired state. The materialized view and materialized view log are always created in tablespace PSMATVW. This is a new tablespace delivered in the standard tablespace script. It is not possible to set the tablespace to something else as for a normal table because it is a view. This is unfortunately because, I might not want all my materialized views in the same tablespace. Even though the materialized view is replicated by primary key, the materialized view log also contains the rowid and the supplementary columns. This is overkill. The materialized view log as built be application designer contains every length-bounded column in the source table. This can significantly increase the overhead of the materialized view log which is maintained as other process update the source table. The materialized view inherits the primary key from the source table because it is a single table materialized view replicated using the primary key. Therefore there is also a unique index on this materialised view. The build script clears out the MV_CAPABILITIES_TABLE when it drops the materialized view. This table is used to hold the output from DBMS_MVIEW.EXPLAIN_MVIEW (see Oracle Database Data Warehousing Guide - ), which Application Designer executes when the materialized view record is saved. Example 3:DMK_DPT_SEC_MVW is a materialised view that is cloned from security view DEPT_SEC_SRCH. But only 4 views appear in PSPTMATVWDEP. PS_SJT_DEPT was not added. I think this is because it tried and failed to add primary key constraint and materialized view log to PS_SJT_DEPT because it has a 'duplicate key' defined in Application Designer. The following errors are found in the build log even if the build script is not executed. Application Designer worked out that PS_SJT_DEPT was referenced in the materialized view query, but it didn't check that the table does not has a unique key defined in PeopleTools. In this case I will try to create a materialized view on a complex query, but this time the underlying table has a unique key. When I try to build the materialized view I get the following entries in the error log. These warnings were obtained from the entries in MV_CAPABILITIES_TABLE which was populated by an attempt to describe the query. SQL Build process began on 16/02/2015 at 21:05:30 for database HR92U011. Error: Cannot create Materialized View on record DMK_JOB_CUR_MVW. SQL Build process ended on 16/02/2015 at 21:05:30. 1 records processed, 1 errors, 15 warnings. SQL Build script for all processes written to file C:\Temp\PSBUILD.SQL. SQL Build log file written to C:\Temp\PSBUILD.LOG. So, Application Designer does try to prevent you from creating materialized views that Oracle won't manage, but the messages back are a little obscure. If I change the refresh mode to Complete, Application Designer does not create materialized view logs. Also, It doesn't create a primary key constraint on either the underlying table or the materialized view. So this materialized view doesn't have any indexes. One common use of complex materialized views is to allow the optimizer to rewrite the query to use the materialized view when it sees the same query as was used to create the materialized view. Optionally the optimizer will also check that the view is up to date. I have added the enable query rewrite clause. However, expressions - in this case one generated to determine the current effective-dated department - are not supported for query write. This could make it very difficult to use the feature in PeopleSoft. If you want to use the materialized view you are likely to have to reference it explicitly in the code. There is a new component to manage the refresh frequency of materialized views. This component will schedule an Application Engine process called PTMATREFVW. Effectively, for each materialized view, this creates a refresh group and a database job that refreshes it. But I might want to group related materialized views together into a single refresh group. I might want to refresh the job at a particular time, which can be done with a more sophisticated function in the interval. I might prefer to refresh a materialized view at a particular point in a batch schedule. So I might prefer to code that into an application engine, or have the application engine submit a job that only fires once and does resubmit (depending on whether I want to wait for the refresh). It is useful to be able to define the materialized view query in PeopleTools along with the rest of the applicaiton. The use of EXPLAIN_MVIEW to test the validity of the materialized view and to populate MV_CAPABILITIES_TABLE is clever, but the messages are obscure and should be better documented. No checking that a source table in the local database doesn't have a unique key that will support a primary key. I can't build indexes on materialized view. Although, the primary key will be inherited automatically on single table materialized views. So you will have to handle that manually outside PeopleTools. There is no support for rowid based materialized views. The materialized view logs created by Application Designer are totally overblown - there is far too much data being logged. They should be either primark key or rowid (if primary key is not possible), but not both. I cannot see the point of the additional columns. I think they are a waste of resource. The flip-flopping of the build script is confusing; you will never be completely sure what you have in the database. The script dropping the materialized view unnecessarily, which will drop any indexes that you have created manually! I think some of the problems stem from trying to graft materialized views onto the existing view record type, instead of creating a new record type and building it into Application Designer properly and giving it the attributes of both a table and a view. There is not enough control over when a materialized view is refreshed. Just a time interval is not good enough. In most systems, you need better control. It is clearly going to be difficult getting database query rewrite to work with complex materialized views in PeopleSoft, especially if effective-date logic is required. However, that is a reflection on the application code rather than the way support for materialized views has been implemented. Complete - pretty much mandatory for multi-table views, but there are some exceptions to this rule described in the Oracle database documentation. Fast - only for single table - rarely used within a single database - more commonly used for moving data between databases. In which case, you need database links and the materialized view log goes onto the source database and the materialized view is created on the target. On schedule by a database job. Deferred - the materialized view is not poplulated when it is created, and will have to be completely refreshed at some point in the future. Choice of refresh method and mode is often a function question. How stale can the materialized view be allowed to be, especially if you can't get query rewrite to work. Thoughtful design is required. I have seen systems severely degraded by the query and redo overhead of excessive refresh. PeopleTools support of materialized views certainly has some good things, but as it stands it is of limited use when it still leaves you with a lot of manual administration to do. In most systems it is the DBAs who will have to manage the materialized views. They are generally resistant to using PeopleSoft specific tools to do database administration. That is going to be even more challenging when only a part of the job can be done in PeopleSoft.